Holly Chayes » Three yays for fabulous, easy knitting. Three yays for fabulous, easy knitting. I started a new shawl, and it’s not even my pattern. Which means I don’t really need to think about what I’m doing, or right down any pattern instructions. Because the pattern’s easy, and already written, and written beautifully, so all I need to do is follow the stinking thing, and not mess it up. Which has been going marvelously (except for that bit where I forgot to keep track of what I was doing, and royally screwed it up, and then had to rip and reknit this morning, oops) apart from that it’s been fabulous. yay! And on US 7 needles and worsted weight yarn, it’s a super speedy knit. yay! 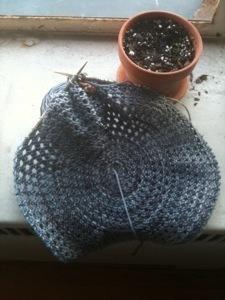 The pattern isn’t out yet, because this is a sample knit for a friend, but I’ll be sure to let you know when it is out. Because it makes for fantastic knitting. yay! Big pile of swatches, take 2.